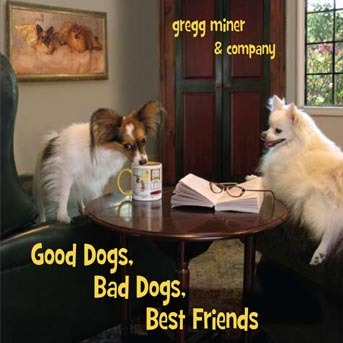 NOTE: A portion of all sales of this CD will go to support the nonprofit Search Dog Foundation. This couple-years-in-the-works "Dog Project" is a co-production with my husband Gregg Miner and me as a tribute to our four-legged friends. We are donating a portion of each CD sale to the Search Dog Foundation.This Foundation is a non-profit organization that recruits rescued dogs and partners them with fire fighters and other first responders to be heroic search and rescue dogs. They participate in search and rescue disasters nationally, such as 9-11 and Hurricane Katrina, and are adding new teams all over the country, while being based in California. You'll find plenty of unusual musical intruments on this album, along with harp guitar, 6-string guitar, harp, hammered dulcimer, piano, and a few other odds and ends, not to mention a few squeak toys. I commissioned some of the pieces, which Gregg wrote over the last couple years, and also invited several dog-loving friends to contribute tunes, photos, and pieces to the project -- love stories, really, each profoundly personal. The tunes hold joy, exhuberance, and the poignant yearning for these best friends who share our lives. You'll laugh, you'll cry, your dogs will wag their tails. Running the instrumental gamut from pastoral sketches to chases, rock & roll-over to wagtime, it's fun for the whole family! Besides being a costumer for the entertainment industry, Jaci also has the Two Little Dogs business and works in product development for Cesar Millan, Inc. 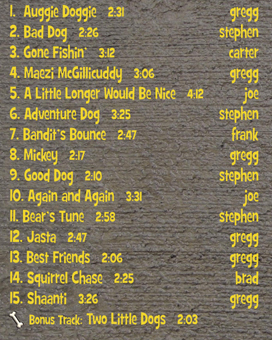 When Cesar's show "Dog Whisperer" first went into production, Gregg wrote "Cesar's Arrival Theme." (Listen when he gets out of the car and runs up to the owner's door.) The show is now in its 6th season on National Geographic Channel and also on DVD. 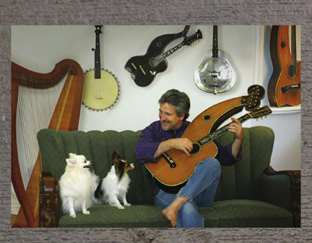 Learn more about Gregg's Harp Guitar Music.